Loons, grebes, and other water-loving birds with their legs at the ‘way back’ of their body cannot take off from land… they need a running / paddling start from water to get airborne. These same birds can mistake wet pavement or puddles on pavement for actual water. 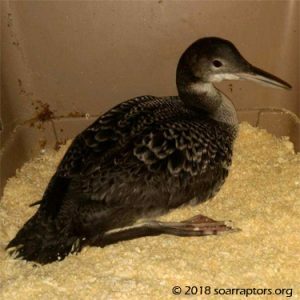 This immature loon landed inside the Clarinda Correctional Facility and someone there called Page County Conservation. Conservation staff rescued and met up with SOAR. This loon is a bit banged up from the non-water landing and is also a tish on the thin side. Learn more about the common loon from the Cornell Lab of Ornithology.